There are few spaces in this world that invoke feelings which cannot be described in words. Deep down in the bedrock of lower Manhattan, the National 9/11 museum is one such space, profound in symbolism and emotions—it saddens you, it enrages you, it deeply moves you. It symbolizes the determination of individuals and families. It symbolizes the resiliency of a city and a nation. The museum opened to the public on Wednesday, and entry is free for the families of 9/11 victims and relief workers. 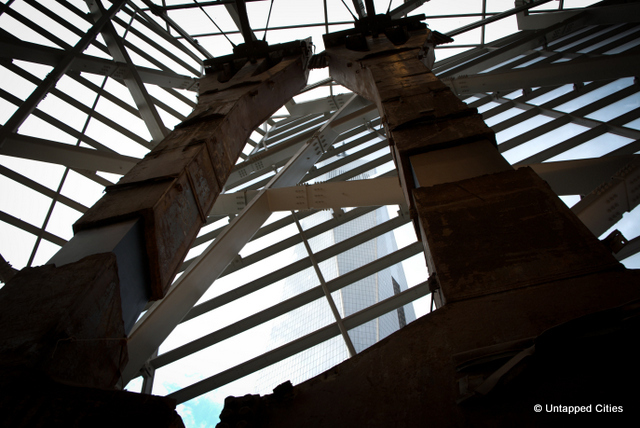 Inside the museum, the mangled remnants of the twin towers, memories of those lost, and excruciating visuals and sounds resonating from around the world bring back the shock and trauma of September 11, 2001. Yet, the museum also exemplifies the courage and strong foundation that America was built on. The following photos give glimpses of the experience and plethora of emotions that the 9/11 Museum evokes. We believe the images speak for themselves. The museums entry pavilion includes two steel “Tridents” from the Twin Towers. The slurry wall was once part of the foundation of the twin towers, built to hold back water from the Hudson River. Remnants of the box columns, that formed part of the foundation and structure of the North Tower. Foundation hall includes the ‘last column’ a 36 foot tall piece of steel signed by first responders, recovery workers and volunteers. ‘Point of impact’- Remnant of the North Towers’ structural steel facade. along the tribute walk. Foundations of twin towers. Images in the background show the construction of twin towers- from bedrock to tallest towers in the world. ‘Recovery at ground zero’ – Visuals projected on remnant ‘trident’ highlights the experiences of recovery workers.